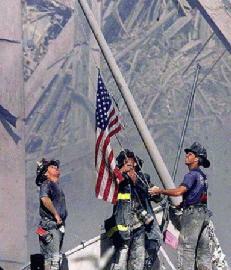 I wanted to reflect on the fifth year since 9-11-2001. That day I was teaching history at a Christian school in Ohio, already having started into my regular routine. My classroom was in the library and someone told me to turn the TV on because a plane had flown into the World Trade Center. I turned it on briefly, and then went back to teaching, figuring that it was an accident. It wasn’t too long after that when the assistant administrator popped his head in the door and told me a plane just went into the Pentagon. I said, “no way”! I turned the TV back on and it stayed on most of the day after that. Before we left school, the whole Jr/Sr High met in my classroom/library and we had a prayer meeting. We did not know all the details yet, but knew it was enough to cause concern and a certain level of fear. At the same time, we knew we had a God that would be our strength through whatever we would have to face. We prayed for the victims. We prayed for the surviving families. We prayed for our president. We prayed for our students. We prayed for our families. We prayed for our staff. Psalm 31:1-4 – In You, O LORD, I have taken refuge; Let me never be ashamed; In Your righteousness deliver me. Incline Your ear to me, rescue me quickly; Be to me a rock of strength, A stronghold to save me. For You are my rock and my fortress; For Your name’s sake You will lead me and guide me. You will pull me out of the net which they have secretly laid for me, For You are my strength. God Bless America, the land which we love!